“I wanted to keep my faith more than I wanted a higher salary,” says Jin Rong Gao. While the offering is being taken, ask the children to sing “Jesus Loves Me” in Chinese (see page 34 in the Children’s Mission quarterly, which can be downloaded at: bit.ly/childrensmission). Narrator: This quarter we have met people from South Korea, Japan, Mongolia, and China, which are all countries within the Northern Asia-Pacific Division. Today we will meet a man from Taiwan. Speaker: Grinding and polishing metal bicycle frames doesn’t command a high salary at a factory workshop in central Taiwan, but it comes with a major benefit: no Sabbath work. Jin Rong Gao [pronounced: jin rong gow] and his wife joined the 16-member workshop team when they moved to the town of Shih-kang[pronounced: shih-kang] several years ago. The married couple, who left their previous jobs because of a Sabbath conflict, started off with a combined monthly income of about 15,000 Taiwanese dollars, or U.S.$500. Jin Rong persisted, and eventually seven relatives received jobs. Jin Rong struggled with the small salary for the next three years and considered looking for another job. But he feared that he would be forced to work on Sabbath elsewhere, so he stayed. “I wanted to keep my faith more than I wanted a higher salary,” he said. 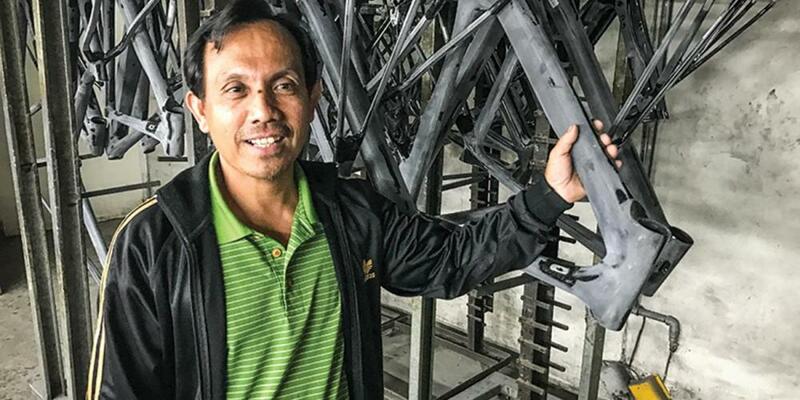 God must have seen Jin Rong’s needs because suddenly the workshop saw a spurt in bicycle frame orders from the factory that assembled the bicycles. Jin Rong and his wife began to earn up to 70,000 Taiwanese dollars, or $2,300, a month. Jin Rong also was promoted to workshop foreman. He was grateful for the additional money, but he worried that he might be required to work on Sabbath to keep up with the orders. His fears were realized on a Friday afternoon when the boss announced at a workshop meeting that all 16 employees would need to start working on Saturdays. Jin Rong had trouble sleeping that night. Not only his job was at stake, but so were the jobs of his wife and the other seven relatives at the workshop. He told God about the situation. In the morning, he and his relatives went to church. “We decided that we would keep our faith, not our jobs,” he said. The boss was furious. More than half his workers were at church instead of filling an urgent order. He angrily told the seven other employees to take the day off. He said they had to work after sundown Saturday and on Sunday as well. He told them to share the new work schedule with Jin Rong. The Adventist employees gladly worked after sunset Saturday and on Sunday. Jin Rong was shocked. “Didn’t you say that I would lose my job if I chose the Sabbath?” he said. The boss said demand for bicycle frames had grown so large that he had decided to open a second workshop. Jin Rong would be placed in charge of the new workshop, a promotion that included hiring and training new employees and a significant pay increase. The only catch was he would be required to work on Sabbath. The job offer represented a promising opportunity, but Jin Rong remembered Psalms 37:5, which says, “Commit your way to the Lord, trust also in Him, and He shall bring it to pass” (NKJV). He decided to commit his way to the Lord and reject the offer. Rather than being upset, the boss announced a permanent change to his workshop’s schedule. He didn’t want to lose a good worker like Jin Rong, so he said the workshop always would close on Sabbaths and operate after sunset and on Sundays. “No one works on Sabbath, not even my boss,” Jin Rong said. Coworkers are impressed by Jin Rong’s strong faith, and four of them have been baptized. Jin Rong sometimes grows exhausted working weekends, but he wouldn’t have it any other way. Narrator: People across the Northern Asia-Pacific Division are praying to be faithful and for help to share the good news that Jesus is coming soon!